DIRECT FROM LOURDES - Saint Martha Medal with Plastic Wallet & Feast Date. Saint Martha Medal with Plastic Wallet & Feast Date. 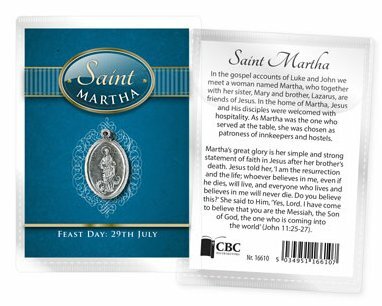 Saint Martha Medal with plastic wallet & feast date 29rd July. On the reverse of the card is a small recollection of Saint Martha, the Medal is an oxidized medal. Size: 2 3/8" x 3 3/8" of the wallet.